This article is about the custom and phrase. For the 2008 film, see Noah's Arc: Jumping the Broom. For the 2011 film, see Jumping the Broom. Jumping the broom (or jumping the besom) is a phrase and custom relating to a wedding ceremony where the couple jumps over a broom. It has been suggested that the custom is based on an 18th-century idiomatic expression for "sham marriage", "marriage of doubtful validity"; it was popularized in the context of the introduction of civil marriage in Britain with the Marriage Act 1836. There have also been suggestions that the expression may derive from an actual custom of jumping over a "broomstick" (where "broom" refers to the plant common broom rather than the household implement) associated with the Romani people of the United Kingdom, especially those in Wales. 1 As an expression for "irregular marriage"
As an expression for "irregular marriage"
References to "broomstick marriages" emerged in England in the mid-to-late 18th century, always to describe a wedding ceremony of doubtful validity. The earliest use of the phrase is in the 1764 English edition of a French work: the French text, describing an elopement, refers to the runaway couple hastily making un mariage sur la croix de l'épée (literally ‘marriage on the cross of the sword’), an expression the English translator freely renders as ‘performed the marriage ceremony by leaping over a broomstick’. A 1774 usage in the Westminster Magazine also describes an elopement. A man who had taken his under-age bride off to France discovered it was as hard to arrange a legal marriage there as in England, but declined a suggestion that a French sexton might simply read the marriage service through before the couple as "He had no inclination for a Broomstick-marriage". In 1789 the rumoured clandestine marriage between the Prince Regent and Maria Fitzherbert is similarly referred to in a satirical song in The Times: "Their way to consummation was by hopping o’er a broom, sir". Despite these allusions, research by the legal historian Professor R. Probert of Warwick University has failed to find any proof of an actual contemporary practice of jumping over a broomstick as a sign of informal union. Probert also points out that the word broomstick was used in the mid-18th century in several contexts to mean ‘something ersatz, or lacking the authority its true equivalent might possess.’ She therefore argues that because the expression broomstick marriage, meaning 'sham marriage', was in circulation, folk etymology led to a belief that people must actually have once signified irregular marriage by jumping over a broom. Tyler D. Parry, Associate Professor of African American Studies, contests the claim that no literal jump was used in Britain, arguing that enslaved people of African descent and British migrants engaged in numerous cultural exchanges during the 18th and 19th centuries. He shows numerous correlations between the ceremonies of slaves and those of the rural British, contending it is not simply coincidental that two groups, separated by an ocean, utilized similar matrimonial forms revolving around the broomstick. If British practitioners never used a physical leap, Parry wonders how enslaved people in the US South learned of the custom. There are later examples of the term broomstick marriage being used in Britain, always with a similar implication that the ceremony so performed did not create a legally binding union. This meaning survived into the early nineteenth century: during a case heard in London in 1824 regarding the legal validity of a marriage ceremony consisting of nothing more than the groom placing a ring on the bride's finger before witnesses, a court official commented that the ceremony "amounted to nothing more than a broomstick marriage, which the parties had it in their power to dissolve at will." A decade later, the Marriage Act 1836, which introduced civil marriage, was contemptuously referred to as the ‘Broomstick Marriage Act’ by those who felt that a marriage outside the Anglican church did not deserve legal recognition. Some also began to use the phrase to refer to non-marital unions: a man interviewed in Mayhew's London Labour and the London Poor admitted: "I never had a wife, but I have had two or three broomstick matches, though they never turned out happy." 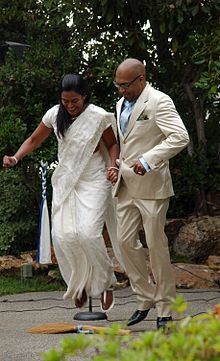 Tinkers were said to have a similar custom of marriage called "jumping the budget", with the bride and groom jumping over a string or other symbolic obstacle. Charles Dickens' novel, Great Expectations (first published in serial form in the publication All the Year Round from 1 December 1860 to August 1861), contains a reference in chapter 48 to a couple having been married "over the broomstick." The ceremony is not portrayed, but the reference indicates that the readers would have recognized this as referring to an informal, not a legally valid, agreement. It has often been assumed that, in England, jumping over the broom (or sometimes walking over a broom), always indicated an irregular or non-church union (as in the expressions "Married over the besom", "living over the brush"), but there are examples of the phrase being used in the context of legal weddings, both religious and civil. Other sources have stepping over a broom as a test of chastity, while putting out a broom was also said to be a sign "that the housewife’s place is vacant" and a way, therefore, of advertising for a wife. In Wales, Romani couples would get married by eloping, when they would "jump the broom," or jump over a branch of flowering common broom or a besom made of broom. Welsh Kale and English Romanichals and Romanichal populations in Scotland practised the ritual into the 1900s. C.W. Sullivan III (1997) in a reply to Dundes argued that the custom originated among the Welsh people themselves, known as priodas coes ysgub ("besom wedding"), Sullivan's source is the Welsh folklorist Gwenith Gwynn (a.k.a. W. Rhys Jones), who assumed that the custom had once existed on the basis of conversations with elderly Welsh people during the 1920s, none of whom had ever seen such a practice. One had claimed that: "It must have disappeared before I was born, and I am seventy-three". Gwynn's dating of the custom to the 18th century rested on the assumption that it must have disappeared before these elderly interviewees were born, and on his misreading of the baptism register of the parish of Llansantffraid Glyn Ceiriog. Local variations of the custom were developed in different parts of England and Wales. Instead of placing the broom on the ground, and jumping together, the broom was placed in an angle by the doorway. The groom jumped first, followed by the bride. In southwest England, in Wales, and in the border areas between Scotland and England, "[while some] couples ... agreed to marry verbally, without exchanging legal contracts[,] .... [o]thers jumped over broomsticks placed across their thresholds to officialize their union and create new households", indicating that contractless weddings and jumping the broomstick were different kinds of marriage. Alan Dundes (1996) notes the unusual development of how "a custom which slaves were forced to observe by their white masters has been revived a century later by African Americans as a treasured tradition". There have been occasional speculations to the effect that the custom may have origins in West Africa, but there is no direct evidence for this, although Dundes points to a custom of Ghana where brooms were waved above the heads of newlyweds and their parents. Among southern Africans, who were largely not a part of the Atlantic slave trade, it represented the wife's commitment or willingness to clean the courtyard of the new home she had joined. Tyler D. Parry argues the Ghanaian connection is a weak case for its origins, especially considering the ritual used by slaves bears far more similarities to the custom in the British Isles. Parry argues that, despite the racial animus that characterized the US South in the nineteenth century, poor white southerners (many of them descendants of people who used irregular forms of matrimony in Britain) and enslaved people exchanged their cultures between one another at far greater rates than commonly acknowledged. Jumping the broom fell out of practice when blacks were free to marry legally. The practice did survive in some communities, and the phrase "jumping the broom" was synonymous with "getting married," even if the couple did not literally jump a broom. However, despite its smaller scale continuity in certain rural areas of the United States (among both black and white communities), it made a resurgence among African Americans after the publication of Alex Haley's Roots. Danita Rountree Green describes the African American custom as it stood in the early 1990s in her book Broom Jumping: A Celebration of Love (1992). American singer-songwriter Brenda Lee released the rockabilly song "Let's Jump the Broomstick" on Decca Records in 1959. Via its association with Wales and the popular association of the broom with witches, the custom has also been adopted by some Wiccans. In a 2013 episode of Grey's Anatomy, Miranda Bailey and Ben Warren jump over a broom at the conclusion of their wedding ceremony. In the classic 1977 TV mini-series Roots, Kunta Kinte/"Toby" (played by John Amos as adult Kunta Kinte - Levar Burton played the teenager Kunta Kinte) had a marriage ceremony where he and Belle (played by Madge Sinclair) jumped the broom. In the 2016 film The Birth of a Nation, a couple getting betrothed is seen jumping a broom. In an episode of The Originals (season 2) (Episode 13 "The Devil is Damned") the custom is described as being necessary when a priest is not available and the wedding "couldn't wait." In an episode of This Is Us (season 3) (Episode 16 "R & B") the characters of Randal and Beth are shown to jump the broom while walking down the aisle after their wedding ceremony in a flashback. The custom has been reference twice by rap duo Outkast: in "Call the Law" on their 2006 album Idlewild and in 2007 song International Players Anthem (I Choose You). ^ "Cathnach's illustrated twopenny-sheets of the 1820s carried charming drawings of broomstick weddings" R.B. Outhwaite, Clandestine Marriage in England, 1500-1850, A&C Black, 1995, p. 140. ^ Dundes, Alan (26 May 1996). ""Jumping the Broom": On the Origin and Meaning of an African American Wedding Custom". The Journal of American Folklore. 109 (433): 324–329. doi:10.2307/541535. JSTOR 541535. ^ a b c Thompson, T. W. "British Gipsy Marriage and Divorce Rites", quoted in The Times, Issue 54004, 21 September 1928; p.11. A paper read at the 1928 jubilee congress of the Folk Lore Society in London refers to this: "In Wales there was preserved until recently a marriage ritual of which the central feature was the jumping of the bride and bridegroom over a branch of flowering broom or over a besom made of broom." ^ Parry, Tyler D. (May 2015). "Married in Slavery Time: Jumping the Broom in Atlantic Perspective". Journal of Southern History. 81 (2): 273–312. ^ Dundes, Alan (Summer 1996). "'Jumping the Broom': On the Origin and Meaning of an African American Wedding Custom". The Journal of American Folklore. 109 (433): 327. doi:10.2307/541535. ^ "In a short story published in 1896 a character remarks of two lovers who are keen to wed, "Young 'n' old has be'n lookin' constant fer these two ter jump the broomstick 'n' give 'em weddin' cake, 'n' chicken pie."". The New York Times. 29 March 1896. ^ Dundes, Alan. "'Jumping the Broom': On the Origin and Meaning of an African American Wedding Custom", The Journal of American Folklore, 1996, p.327. ^ Sullivan, C. W. (1 January 1997). ""Jumping the Broom": A Further Consideration of the Origins of an African American Wedding Custom". The Journal of American Folklore. 110 (436): 203–204. doi:10.2307/541813. JSTOR 541813. ^ a b Gwynn, Gwenith (W. Rhys Jones). "'Besom Wedding' in the Ceiriog Valley", Folklore, Vol. 39, No. 2, 30 June 1928, pp.149-166. ^ Jones, T. Gwynn. Welsh Folklore, 1930. ^ Evans, Tanya, Women, Marriage and the Family, in Barker, Hannah, & Elaine Chalus, eds., Women's History: Britain, 1700–1850: An Introduction (Oxon/London: Routledge, 2005 (ISBN 0-415-29177-1)), p. 60 & n. 19 (n. omitted) (author Evans postdoctoral research fellow, Ctr. for Contemp. Brit. Hist., Institute for Historical Research, London, editor Barker sr. lecturer history, Univ. of Manchester, & editor Chalus sr. lecturer history, Bath Spa Univ. Coll. ), citing, at p. 60 n. 19, Gillis, J., Married But Not Churched: Plebeian Sexual Relations and Marital Nonconformity in Eighteenth-Century Britain, in Eighteenth-Century Life, vol. 9 (1985), pp. 32–34, & Leneman, Leah, Promises, Promises Marriage Litigation in Scotland, 1698–1830 (Edinburgh: no publisher, 2003), pp. x–xi. ^ a b Parry, Tyler (2011). "An Irregular Union: Exploring the Welsh Connection to a Popular African American Wedding Ritual" in Welsh Mythology and Folklore in Popular Culture: Essays on Adaptations in Literature, Film, Television and Digital Media edited by Audrey L. Becker and Kristin Noone. Jefferson, NC: McFarland and Company, Inc. pp. 109–110, 123–124. ^ Parry, Tyler D. (2016). "The Holy Land of Matrimony: The Complex LEgacy of the Bromstick Wedding in American History". American Studies. 55 (1): 81–106. ^ "The sort of difficulties which might arise were raised by an anti-slavery correspondent in 1824 in The Times discussing Jamaican slaves. He asked what changes a recent increase in church marriages among them had actually achieved: "Do they legally prevent a master from separating husband and wife, at his pleasure, by sale or transfer? Do they legally bind the husband to the wife, and the wife to the husband? Do they give to the husband the right and the means of redress against the violator of his conjugal peace?"". The Times. 3 February 1824. p. 3. ^ "A Slave's Marriage Valid: Its Legality Defined". New York Times. 20 July 1876. A New York court upheld the retrospective validity of a marriage between Anthony Jones and Patsy Minor, even though at the time and place it had been contracted such marriages between slaves were not legally recognized. Both Jones and Minor had been slaves in Virginia when, with consent of their respective masters, they declared an intention to live together as man and wife. Jones later died intestate in New York, leaving an estate valued at $15,000; a court ruled in favour of the claims of his widow and surviving son. ^ Parry, Tyler (2011). "An Irregular Union: Exploring the Welsh Connection to a Popular African-American Wedding Ritual" in Welsh Mythology and Folklore in Popular Culture: Essays on Adaptations in Literature, Film, Television, and Digital Media edited by Audrey L. Becker and Kristin Noone. Jefferson, NC: McFarland and Company, Inc. p. 123. ^ Parry, Tyler D. (2016). "The Holy Land of Matrimony: The Complex Legacy of the Broomstick Wedding in American History". American Studies. 55 (1): 81–106. ^ Jumping the Broom: Besom Weddings Parry, Tyler (2011). "An Irregular Union: Exploring the Welsh Connection to a Popular African American Wedding Ritual" in Welsh Mythology and Folklore in Popular Culture: Essays on Adaptations in Literature, Film, Television and Digital Media edited by Audrey L. Becker and Kristin Noone. Jefferson, NC: McFarland and Company, Inc. pp. 124–125. Martin Heath, Jumping the broomstick (bbc.co.uk, 2004). Anyiam, Thony C. (2007). Jumping the Broom in Style. Authorhouse. ISBN 1-4259-8638-2. Taylor, Orville W. (1958). "'Jumping the Broomstick': Slave Marriage and Morality in Arkansas". Arkansas Historical Quarterly. 17 (3): 217–231. JSTOR 40018908. This page was last edited on 27 March 2019, at 02:44 (UTC).